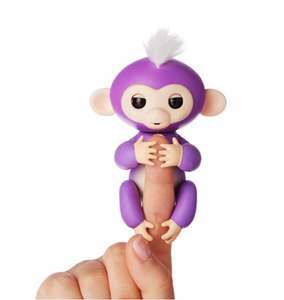 Amazon have the highly sought after White, Turquoise andPurple Fingerlings in stock for immediate despatch. Only one per account though! I'm glad I don't have a girl. Need a different colour one now, thanks heat. The Entertainer had them in for pre order too. I pick mine up on the 20th. Thanks for this op. Purple fingerling will do instead of unicorn! Won't ever deal with toysrus again..... I'm 50miles away and after confirming stock by phone they refuse to hold stock for 1 hour while I drive over. Expect me to do 50mile trips and hope I arrive at same time as delivery driver who may or may not have stock. Or alternatively confirm stock on phone and hope it takes more than an hour to sell which seems unlikely! Never seen an exclusive implemented so badly as the unicorn. Can't see many parents spending more in toysrus as a result of this nonsense. Also doubt the locals who are selling them for £35+ on ebay are spending any extra there either. Oh and that's if you get a real one and not a Chinese knockoff advertised as real. In fairness they are much bigger than the photograph portrays which surprised me as it’s usually the other way round!! Ordered two for my daughter and niece thanks for the heads up! Hmm dump bitcoin and move into small toys sold for vastly inflated prices.. decisions decisions.. In fairness they are much bigger than the photograph portrays which …In fairness they are much bigger than the photograph portrays which surprised me as it’s usually the other way round!! Say what? They are things that fit on your finger... The picture portrays that perfectly. Another one to come and go..Loom Bands..Fidget Spinners....Fingerlings...and my goodness..what next???? What is it? £15 but everyone is buying it? Am I missing something? Anyone near Goole need any?I have 2 on reserve that I no longer need as I managed to get some from my local. Looks like an overpriced troll pencil top. What does it actually do? The pictures suggest these are fake. I'd suggest we remove this listing pending someone looking into this product. Keep searching on Argos we've found 19 within 20 miles of us. They show no stock all day then suddenly a few here or there. We've got them all now so keep looking regularly. Hope that helps. Just a heads up for people ordering this if it is indeed in stock. The wife ordered this on September 22nd for £7.87p & it never arrived. Eventually had a refund off Amazon but the supplier was obviously telling lies as a lot of people were in the same scenario as myself. I even had an email saying saying the product had been dispatched when it quite clearly hadn't. £15 for an average toy advertised on TV? thanks but no. The pictures suggest these are fake. I'd suggest we remove this listing …The pictures suggest these are fake. I'd suggest we remove this listing pending someone looking into this product. If you order from Amazon and make sure the seller is Amazon and not a third party seller you’re item will not be fake. The negative reviews including the comment above regards the £7 item will be from a third party seller. How do the pictures suggest they’re fake?? If you order from Amazon and make sure the seller is Amazon and not a …If you order from Amazon and make sure the seller is Amazon and not a third party seller you’re item will not be fake. The negative reviews including the comment above regards the £7 item will be from a third party seller.How do the pictures suggest they’re fake?? I mean the pictures people put up as reviews. Not a lot my son has one in blue. The head turns, the eyes blink and it make some random noises. Over priced and really feel for parents having to pay over the odds on eBay as stocks are low and they don’t want to disappoint their little one’s. Ordered one on 29/11 with Amazon, said it'd be delivered by today but still not even dispatched. Just a heads up for people ordering this if it is indeed in stock. The …Just a heads up for people ordering this if it is indeed in stock. The wife ordered this on September 22nd for £7.87p & it never arrived. Eventually had a refund off Amazon but the supplier was obviously telling lies as a lot of people were in the same scenario as myself. I even had an email saying saying the product had been dispatched when it quite clearly hadn't. Had exactly the same issue as you. Amazon refunded but the seller should of been kicked off. Apologies for a post of my experiences relevant to the deal. In future I will follow your lead and pop up and tell everyone what a rip off something is when I clearly don't have a clue (or any young children).